These songs, written during Sewanee's time in "Big Football," may have been ones that freshmen learned at Sewanee Night. 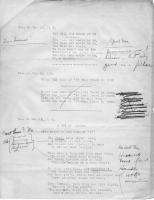 In the margins, it is noted that Auburn or Tennessee should be substituted in the chers for old rival Vanderbilt ("Vandy"). By supporting teams with Sewanee Spirit and cheers, even spectators could be Sewanee Men. Acceptance into the bonds of masculinity at Sewanee involved much more than simply enrolling at the college and attending class. The "Sewanee Spirit," the student newspaper explained in 1925, expresses the "high caliber and fineness" of the Sewanee Man, who, in all circumstances, towers above the rest of humanity as the South's foremost "gentleman," but that "Spirit" had to be learned. Newcomers and freshmen were not truly Sewanee Men until properly initiated into the "traditions" that set the University and its men apart from the common herd. Upperclassmen, often aided by faculty members, conducted the annual "Sewanee Night" (usually before the first home football game) to instill the attributes of the Sewanee Man into the incoming students. This pep-rally was a time-honored tradition at Sewanee, particularly through the 1920s (it has been revived in recent years). Students learned the cheers (usually praising Sewanee's superiority over rival Vanderbilt) and listened to rousing speeches by the chaplain, football players, and the professor of public speaking "Major" Mackellar. "Rat Rules" were printed at the beginning of each year in The Purple. The Ratting Committee, run by sophomores, instructed newcomers to cut out the rules and hang them above their beds. They called for men to join the football team, attend chapel services, and excel in the classroom, and taught the initiates exactly what could be expected of them in the bleachers and on campus. In 1924, Loaring Clark, an alum of the college and student on the School of Theology, explained to the uninitiated that "The Sewanee Man is known by three characteristics: first, by being physically fit; second, mentally alert; and third, he is morally straight." The annual ritual inculcated these new boys with a respect for the Sewanee Man, which allowed them to enter the greater fraternity and family that was the student body. The initiation of freshmen did not stop on Sewanee Night. Through "ratting," a period of extra-fraternal university sanctioned hazing, freshmen were "told their place and kept in it." Historian Winton Solberg notes in his study of hazing at the University of Illinois that while the "brutal horseplay" worried some university administrators, its normalcy across the country assuaged their anxieties. Also, at most universities, ratting took place in the night, outside of the faculty and staff's jurisdiction. Hazing at Sewanee was public. Ratting was run by an appointed council and even had their rules posted in The Purple. These rules required freshmen to carry matches, tip their hats to faculty and gownsmen, be the last to enter the dining hall, and "obey any and all instructions from upperclassmen and run errands and make themselves generally useful. It is important to note that Sewanee students did not regard this treatment as abusive hazing, but rather as the rules necessary to create a Sewanee man. True hazing, apologists for the practice insisted, took place at prepatory schools, "where the students are not exactly expected to conduct themselves as men." At Sewanee, the men were held to these Rat Rules that distinguished them from the brutal hazing of prepatory boys. However, this did not raise the freshmen up as equals. In an editorial in 1927 the Purple writes, "We hope that it is understood that we are not in favor of letting freshmen run wild." Freshmen still needed to be disciplined through their initiation as men, but in the peculiarly Sewanee manner. This pair of photos display the before and after of a Sewanee prank. After a sleeping boy's toe is tied to the door, his classmates slam the door shut, jolting him awake.